How will more realistic portrayals of features important to the water cycle (clouds, aerosols, snowpack, river routing, land use) affect simulations of river flow and associated freshwater supplies at the watershed scale? The water cycle experiments also test the hypothesis that changes in river flow over the last 40 years have been dominated primarily by land use and land cover change (LULCC) and aerosol forcing, but during the next 40 years, greenhouse gas emissions will produce changes to river flow with signatures that dominate the other forcing agents in some major river basins. PMP plot of Global RMS errors for CMIP5 models and E3SM piControl CMIP6 simulation (DECKv1b_piControl). The more blue the color the better the model, the more red, the worst it is compared to all others. In order to address this question, the project first needed to establish the scientific credibility of E3SM v1, including its overall climate and hydrological cycle. To accomplish this objective, the team performed the CMIP6 DECK simulations (Eyring et al., 2016a) using the low resolution (LR) configuration (~100km atmosphere; 30-60km ocean). 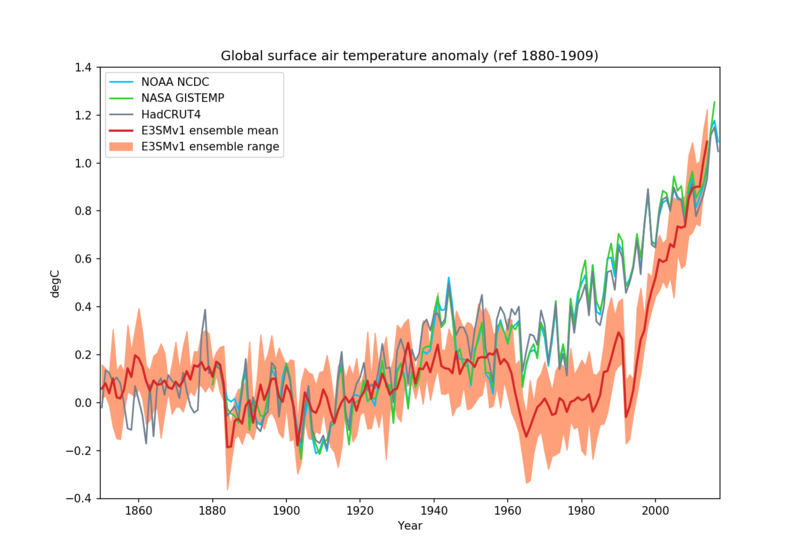 The DECK experiments consist of a long pre-industrial control simulation, two idealized CO2 forcing simulations, and atmosphere-only simulation (AMIP) as well as historical simulations covering the historical record (1850-2014). The DECK simulations are rapidly becoming required benchmark simulations to establish climate model performance and facilitate sharing of model output with a broader community for further analysis. As a whole, DECK covers a period of over 1,500 simulated years. The E3sM v1 DECK simulation campaign was performed early in 2018 and is now complete. Data from the 500 year piControl simulation is publicly available (1deg Atm, 60-30km Ocn). Data from other simulations will be made available as part of the E3SM v1 contribution to CMIP6. Time evolution of global surface air temperature anomaly for a 5-member ensemble of E3SM v1 historical simulations (mean and range) compared to three observational datasets. The model climate in the pre-industrial control simulation is stable. E3SM v1 reaches the stated goal of being better than half of the CMIP5 models for most variables of interest (based on PCMDI Metrics Package; Gleckler et al., 2016). The model climate exhibits many typical coupled model biases. E3SM v1 is a high sensitivity model. The equilibrium climate sensitivity (ECS) estimated from an abrupt quadrupling of CO2 experiment is 5.3K. Based on an ensemble of 5 historical simulations, E3SM v1 is able to approximately simulate the evolution of the temperature over the historical record, albeit with a lack of warming starting in the late 60s and until the 90s, followed by an excessive warming trend in the latter part of the record (see figure). The project hypothesizes that the former is the result of an excessive cooling effect from aerosol cloud interactions and the latter a signal of a the high climate sensitivity. Additional information is available about the v1 CMIP6 piControl simulation as part of the description of the scientifically validated configurations. 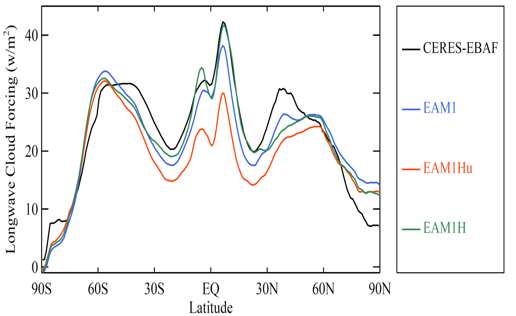 Comparison of CERES-EBAF observations with the EAM model demonstrates that large biases in longwave cloud forcing (LWCF) in the tropics are significantly reduced in the tuned HR model. The standard low-resolution (LR) version of the E3SM v1 model is incapable of sufficiently resolving storm structure and important topographic features. For the model to be useful for regional climate prediction and extreme weather analysis, higher resolution is needed. Explicitly resolving more scales of motion also improves model skill by reducing reliance on sub-grid scale parameterizations. The E3SM team has also developed a high-resolution model (v1) using an ne120 (25 km) high resolution (HR) atmospheric grid and an 6-18 km ocean/sea ice grid. The HR configuration of the E3SM atmosphere model (EAM) was based on the well-tuned LR model, but substantial tuning was needed to produce a reasonable high-resolution climate, which represented a significant computational challenge. Using the short-term hindcast framework developed by the DOE Cloud-Associated Parameterizations Testbed (CAPT) project, the project was able to deliver a well-tuned HR model. In particular, the CAPT tuned HR model shows considerably improved skill compared to the untuned HR model and the LR model for quantities related to the fast physics processes targeted by CAPT. This is demonstrated in the figure above which shows that large biases in tropical longwave cloud forcing (LWCF) are significantly reduced in the tuned HR model. The team has also begun using the high-resolution EAM for science. For example, the tuned HR configuration has been used for hindcast simulations of Atlantic hurricanes and captures realistic storm-scale cloud structures with a much better skill compared to the LR model. Additional information is available about the v1 HR 1950 simulation as part of the description of the scientifically validated configurations. To address the v1 water cycle question and hypothesis, both the low- and high-resolution models will be used in a suite of experiments to be performed as part of the v2 core activity.